We always say after returning from a Sabra/Sabre meeting that it was the best one ever and this year's, over the weekend of 3rd/4th September, was no exception. 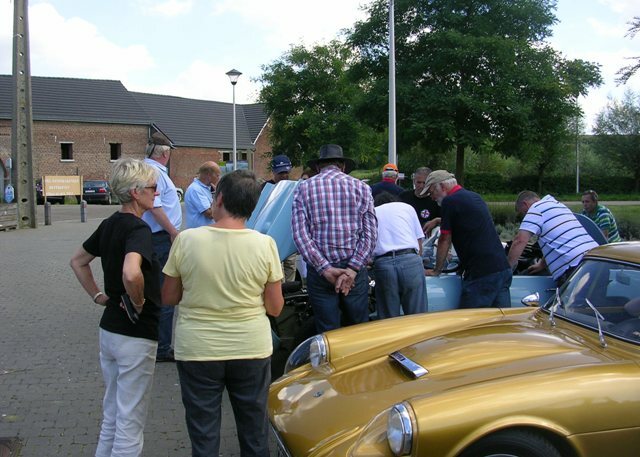 We arrived at the Hotel Soete-Wey in Heusden-Zolder in the Limburg region of Belgium, on Friday afternoon in the glorious sunshine. Most folk were already there and greeted us in the customary way with a glass of beer or wine in their hand. 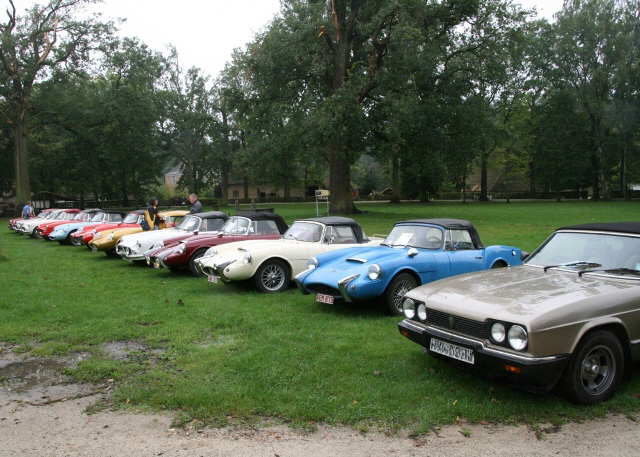 Cars seen for the first time at a Sabra Sabre meeting included Peter and Mariette's superb Sabra convertible. 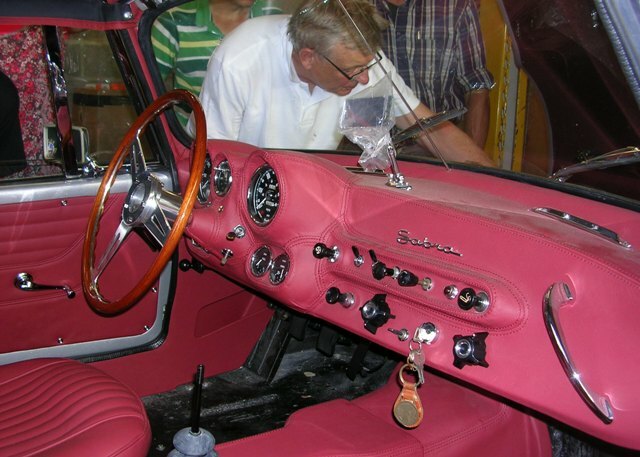 Peter didn't quite complete his restoration in time for last year's meeting so it was well sorted out for this year. 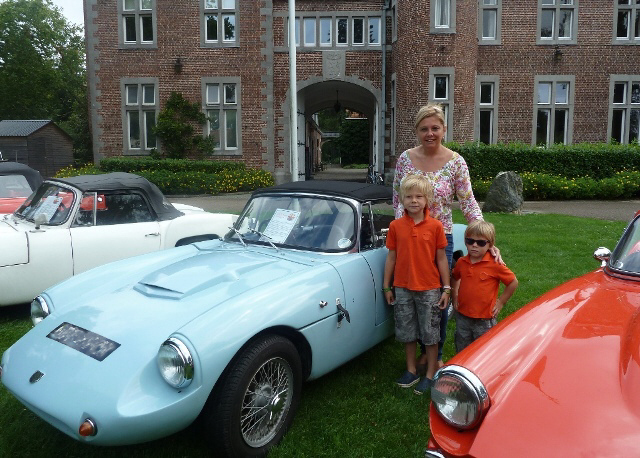 Luc has been restoring his Sabra convertible for several years and just failed to complete it for this year. We did, however, get the opportunity to see the car in his garage on Sunday and, like Peter's car, it has been restored to the highest standard. 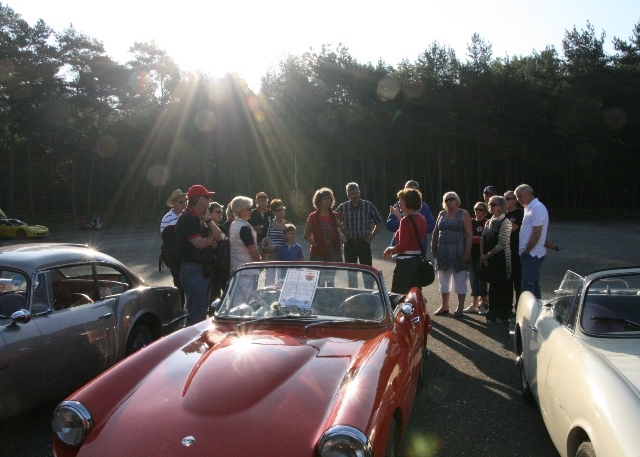 Our Prototype was also a "newcomer" and attracted much attention, particularly from the Sabra owners. 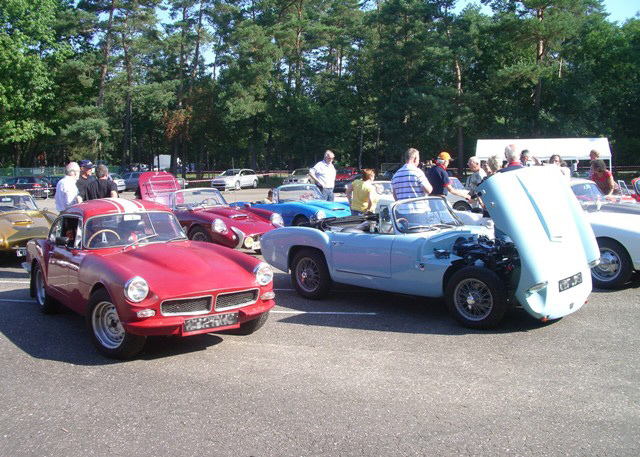 Geoff was planning to attend with his lovely, newly restored Sabre Six but, unfortunately, it developed a cylinder head problem over the Curborough weekend and he had to come to Belgium in his trusty Sabre Four. It's nice to have a standby. The hotel was very good and Luc and Monique, our hosts for the weekend, had arranged an attractive package which included aperitifs and wine as well as our meals and rooms. 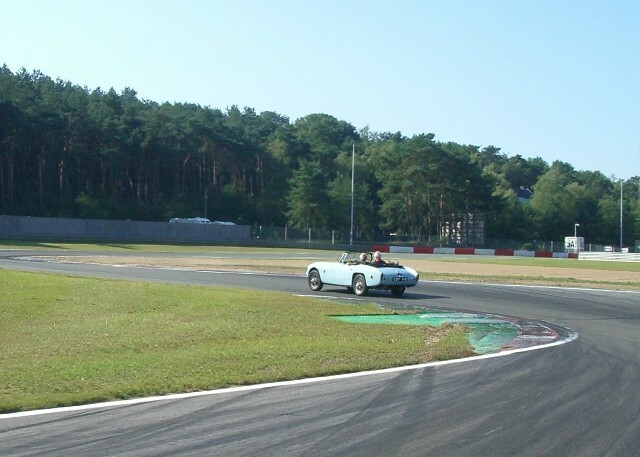 On Saturday the main event was a visit to the Zolder Race Circuit. Here we enjoyed a VIP tour and later were allowed onto the track prior to the start of the 24 hour GT endurance race. Tony, driving the prototype, lead the pack and we were told to follow the course car until it disappeared into the pit lane and then we were free to drive two laps at whatever speed we liked. It was a good shake down for the car!! We were also told that there would be a flag to warn us to get off the track after our two laps. I think Tony caught them out and they didn't realise that our little cars could go so fast. In fact we got there before the flag marshal! When everyone had stopped grinning we left the circuit and took a leisurely drive through the countryside to our lunch stop in Heers. Here we ate lunch in the garden making good use of the parasols as by now it was 28C. In the afternoon we drove to a syrup factory where we learnt all about the manufacture of syrups and juices using locally grown apples and pears. On our return to the hotel there was a rush to take refreshing showers and drink cold beers to cool down before dinner. After our meal the lights were turned down and a 50th Anniversary cake complete with sparklers was wheeled in. We all managed to find a little extra room to sample the cake with our coffee. On Sunday we took a short drive to the open air museum of Bokrijk. Here we were given a tour of the grounds in our cars led by an official on a bike. Usually no cars are allowed into the park but at the end of the drive we parked in front of the castle and were welcomed by the director of the park plus her two adorable young sons. There were many interesting things to see and it was impossible to see everything in a day. Most people stayed for Sunday night also but sadly we did say good bye to some who had to get back for work. A few of us stayed on Monday night also and after bidding farewell to everyone we took a quiet walk in forest that adjoined our hotel and eventually arrived back at the racing circuit where over lunch we watched everyone taking the marquees down following the completion of the 24 hour race for another year. The whole weekend was wonderful and the weather was extremely kind to us all the time (except for a good soaking for the last 100 miles of our return journey home). Luc and Monique's arrangements worked well and we thank them again. 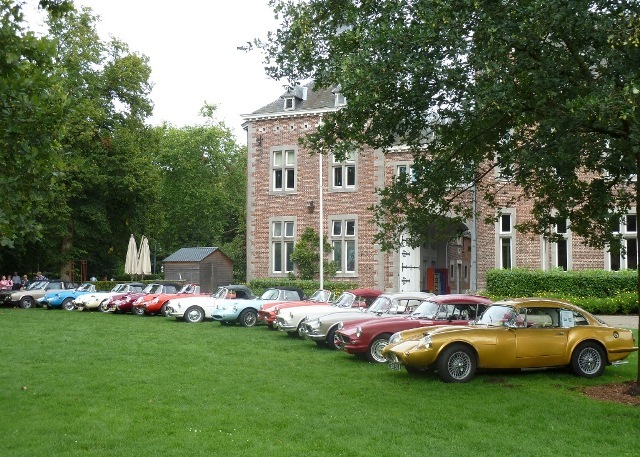 Generally all the cars behaved well during the weekend. We had a problem with our ignition switch. This meant that Jaki had to leap out of the car and look very professional opening the bonnet and pressing the starter solenoid button to start up each time. We then had a problem with the battery earth strap which broke but was rapidly repaired by an army of helpers. Geoff Cooper had a problem with his distributor which was soon fixed though as it happened in the VIP car park at Zolder he did have a rather large audience. Luckily neither car had problems whilst on the circuit or elsewhere during the weekend. Now we look forward to next year. Plans are already afoot.